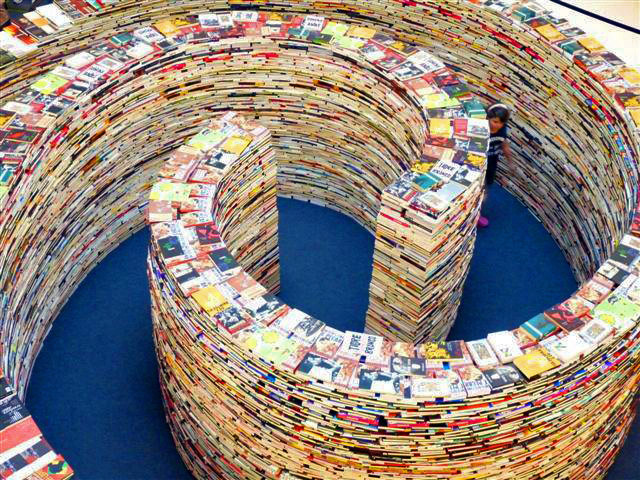 Gigantic aMAZEme Book Maze in London Will Be Made from 250,000 Books! 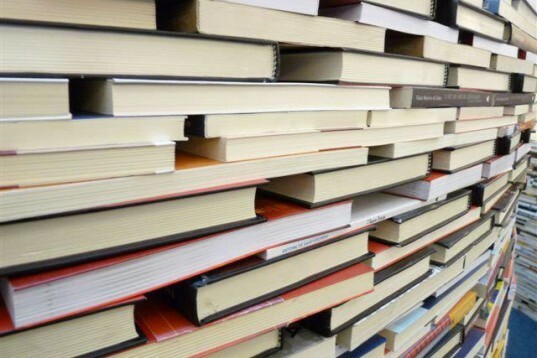 Want to help build an enormous maze that's made entirely from books? On July 26th, Brazilian artists Marcos Saboya and Gualter Pupo will begin constructing an enourmouse book maze in the Clore Ballroom at London's Southbank Centre. The maze, which will cover more than 5,000 square feet, will be made from a whopping 250,000 books and its walls will be 13 feet tall. Saboya and Pupo have developed plans for the maze, but they're hoping the public will help them build it, and they've put out a call on Craigslist for volunteers. The maze isn’t the first collaboration between Saboya and Pupo; the duo previously worked together to create a smaller book sculpture in the Leblon shopping mall in Rio de Janeiro (pictured above). That project featured many of the same elements that will be on display at the London maze, but it was much less ambitious. Judging from the plans, the aMAZEme maze in London looks like a maze you could actually get lost in! The maze was inspired by legendary Argentinean writer Jorge Luis Borges, who had a lifelong fascination with both libraries and labyrinths. The aMAZEme installation will be part of the 12-week London 2012 Festival, which will showcase artists from all over the world in conjunction with the 2012 Summer Olympics. Want to get involved? Head over to the Southbank Centre from July 26th – 30th and lend a hand! That project featured many of the same elements that will be on display at the London maze, but it was much less ambitious. The aMAZEme installation will be part of the 12-week London 2012 Festival, which will showcase artists from all over the world in conjunction with the 2012 Summer Olympics. The maze was inspired by legendary Argentinean writer Jorge Luis Borges, who had a lifelong fascination with both libraries and labyrinths. Judging from the plans, the aMAZEme maze in London looks like a maze you could actually get lost in! Want to get involved? Head over to the Southbank Centre from July 26th - 30th and lend a hand!